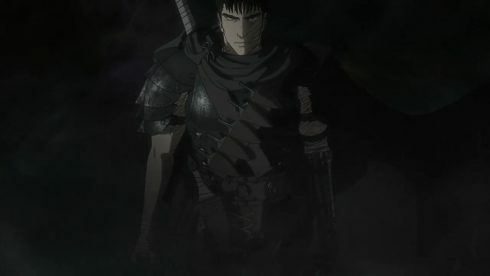 So its finally here, after more than a decade, we finally get a Berserk anime series that adapts the Black Swordsman era of the original manga. 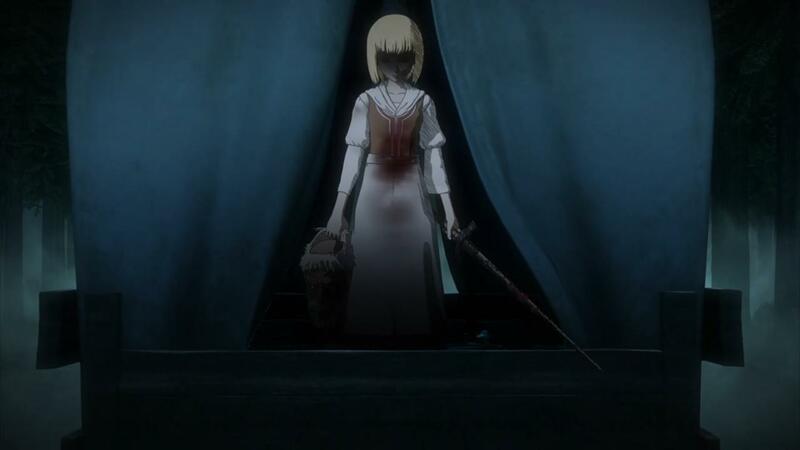 And while I’d call this opening episode a pretty darn strong one, there are some noticeable hiccups that do have me worried for the adaption overall. Not everything is as rosy in Berserk Adaptation land as I would like, But I can’t disregard the inherent joy I feel as we see scenes that I honestly never thought we would, in animated form. First lets talk about the good, because there is quite a bit of that here. 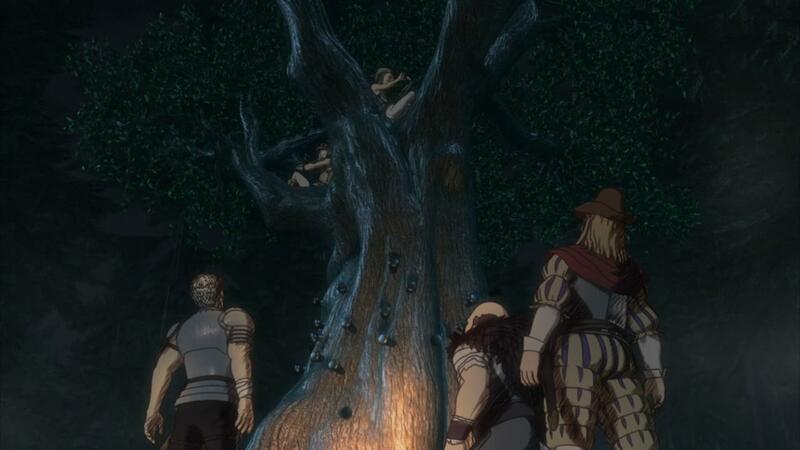 The first episode opens up with a cursory look at all the major players of the story, and also gives the audience a nice preview of the kind of tone and story that this series will have. 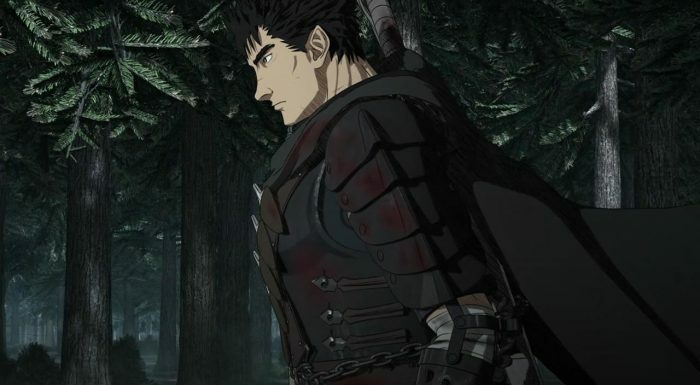 If you’re a newcomer to the Berserk franchise, I’d recommend watching the prequel movies (There’s a three of them) that came out a few years ago first… Because in many ways, this series is a direct sequel to that trilogy of movies, and even uses a good chunk of scenes from them, in its opening theme. That’s honestly a pretty clever way to just refresh memories of what happened before the events of this series. In preparation for this new series, I myself actually watched all three movies a few weeks ago and was generally pretty happy with them. The story for this episode, picks up some good time after the last movie ended, with Guts clearly on his own, traveling the world, with his Black Swords man garb and sword in tow. Yes, Guts uses a Buster sword, but before you go start screaming “Final Fantasy VII ripoff”, remember that Final Fantasy VII came out in 1997, and Berserk’s original manga in 1989. 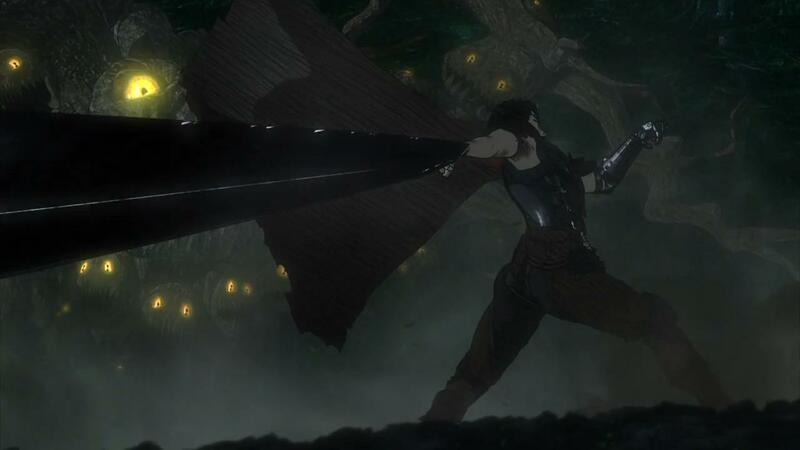 So it was in fact, Berserk that actually created the whole visual of a giant hulking mass of Iron that resembles a sword, being used, one handed by a rather buff man. 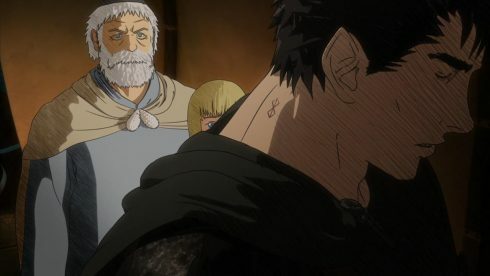 History lessons aside, what this episode really did was show us how much the world has changed since Guts’ time with The Band of the Hawk and Griffith. The world has become a lot darker, harsher and more ridden with monsters, spirits and demons. That was one of the things that I found so striking about the original manga when I first read it all those years ago. Berserk’s manga actually opens with the stuff we saw this week, and then after a few volumes of being in this dark, high fantasy world, we get a flashback arc that takes us to a time where the world is a bit more normal. Its supposed to be jarring, because the Millennium Falcon/Golden Age Arc, as it’s called, is both the origin story for Guts, and the world that he inhabits. And as you saw from this episode, Berserk is a dark, gritty story, where happy endings are as much of a fairy tail, as the evils and spirits that we see on screen. 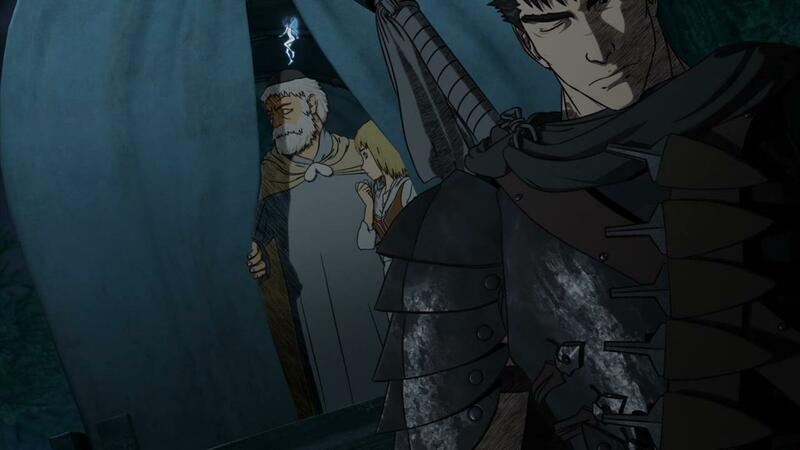 The whole segment where Guts being welcomed onto a carriage by an old man and his daughter, and then trying to warn them in vain about the dangers of being around him, is a nice indication of the series and story as a whole. Kindness doesn’t survive for long in this world, nor does skepticism and ignorance, and even the strong like Guts, can’t protect the weak from the horrors that await them. The one thing that I found particularly noteworthy, was how cold Guts has become since we last saw him. He’s had to harden himself, and get over the fact that he’s bringing death with him everywhere he goes. 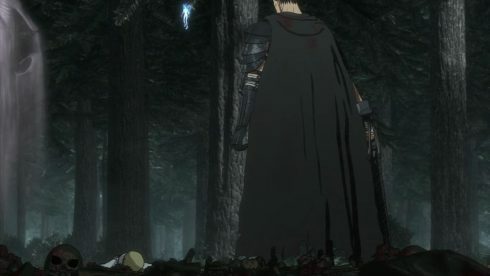 Its easy to think of Guts as a bit of a jerk, and he certainly comes off that way after the big battle with all the monsters in the forest, but I think that’s not the whole picture. 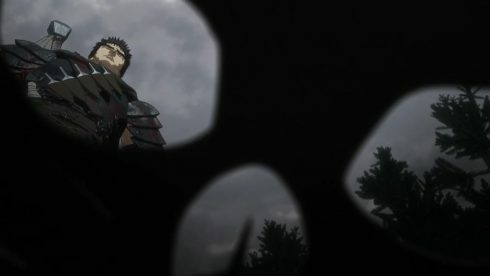 I see Guts’ maniacal laugh and detachment as a coping mechanism, and I think as we move onto the next story, we’ll begin to truly see what and who Guts really is. This actually wasn’t an episode about him, it was about the world that he’s stuck in, after all. And I think, from a story beat perspective, this episode does its job of introducing us to the world that we’re going to reside in, for however long this series ends up being. So, good opening episode, dark grim story, nails the essence and atmosphere of the original manga, at least in my opinion. So what’s the bad? Well, the real sticking point for me in this premiere, was actually the animation more so than the visuals or art direction. Let me dial back a bit. We’ve already seen the show’s 3D CGI Animation style in the fairly recent movies. 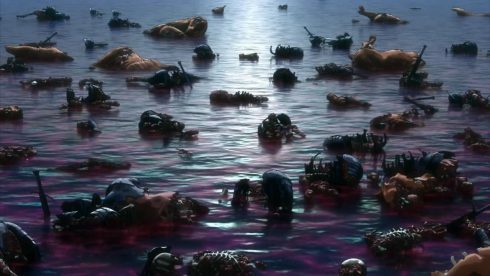 While I wasn’t entirely impressed with the 3D CGI animation that the movies used even then, I did think that it was done competently enough to the point where it didn’t ruin the experience. This week? 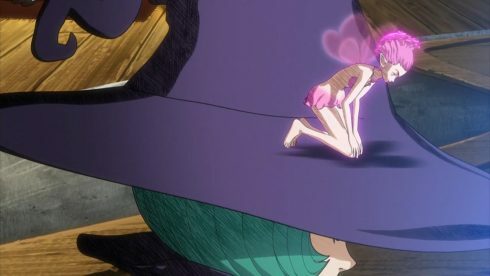 This week I really noticed the 3D CGI, and not in a good way. I felt like the quality of the animation took a rather significant drop from the movies, and while I suppose that was to be expected, it went even lower than I had been prepared for. 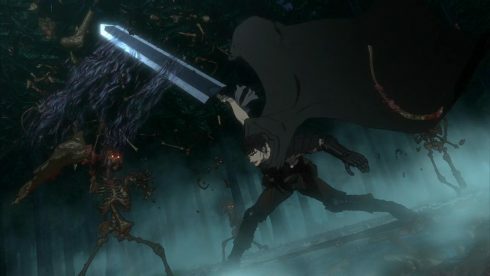 The animations are a lot more jerky, the motions less fluid, the cuts between shots a lot more sudden, and there’s a definite sense that the series is being made on a bit of a budget. And that’s worrying, because there’s only more gigantic, hard to animate scenes and scenarios coming up in the future. 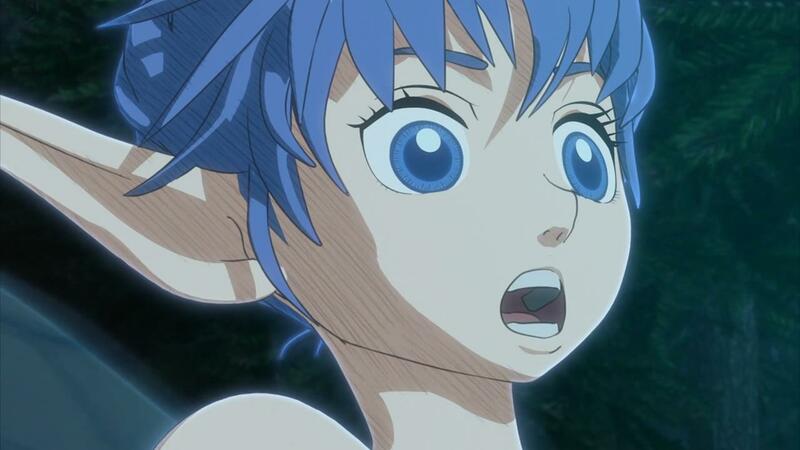 The only reason I think 3D CGI is a necessity for this series, is because of how complex, complicated and ornate the original manga’s drawings and depictions of the world of Berserk really are. The stuff we’re going to see soon? 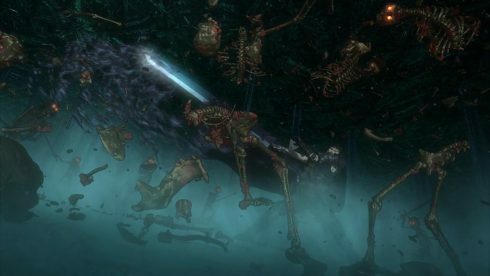 Its going to be epic in terms of scale, and so the only way you could reasonably do that, is through 3D CGI. But, I think if its not managed properly, then it can become distracting, as it was this week. 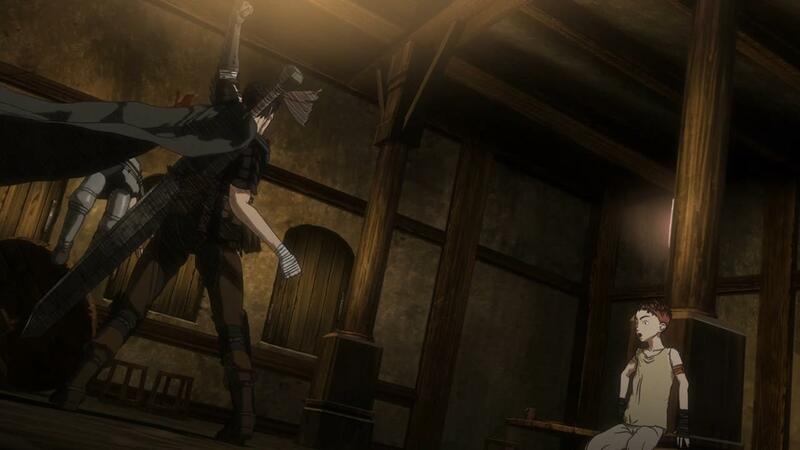 But even more so than the animation, which is a definite sore spot, this episode had some pacing issues. 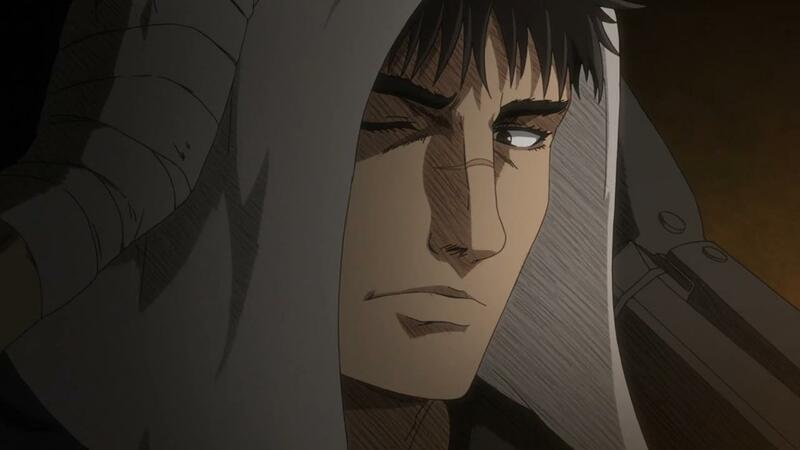 To me, the episode felt a lot more rushed than it should’ve been, and that really worries me. 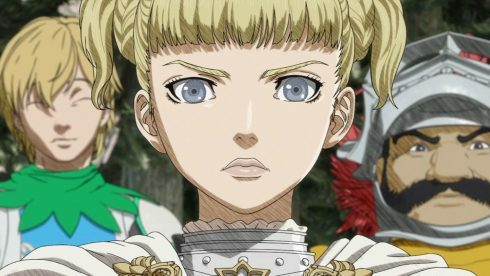 Berserk is a nice, long and deep story, and the opening chapters of the story, right before The Golden Arc, are about three volumes long. 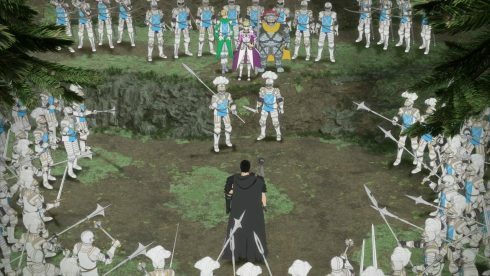 With this episode, we actually cut right through Volumes 1,2 and 3 and jump right into the part after the Golden Age Arc, where Guts runs into the Holy Chain Knights. As is always the case, there are some good things and some bad things with the modifications made here. I think it would’ve been nice to have spent a few episodes establishing Guts and his relationship with Puck, the elf that finally made his animated debut. 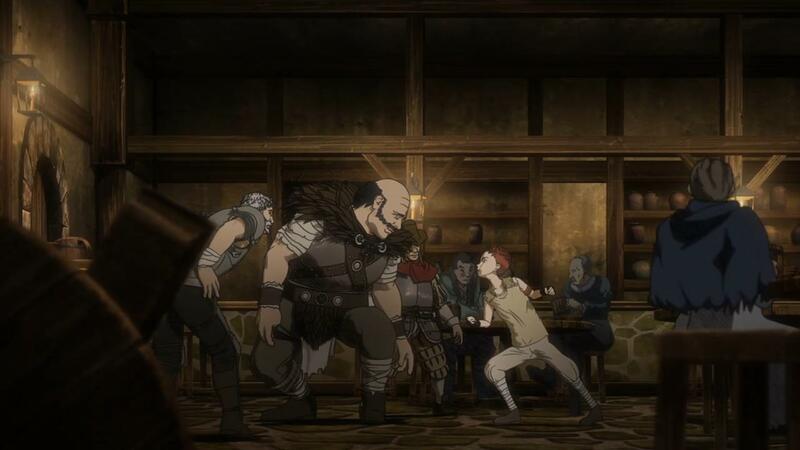 If you recall, the original anime series that came out in 1997 did not feature Puck at all, but what that series was, was a bit more faithful to the opening scene where Guts goes into the Tavern. The boy we encounter, obviously doesn’t make his appearance there, and Guts actually ends up saving a woman there instead (in the original series). The boy isn’t a bad addition, and I confess its been a while so I don’t really remember if he’s a significant character or not. I’ll hazard a guess and say that he is though. 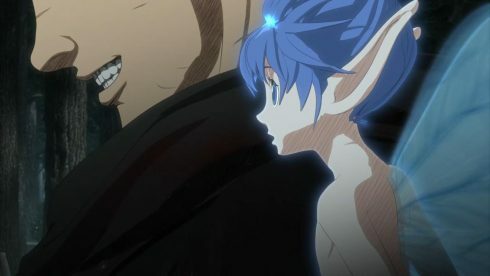 See… My issue with the changes and the pacing, is that we don’t really get that bonding period between Puck and Guts, like we do in the manga. 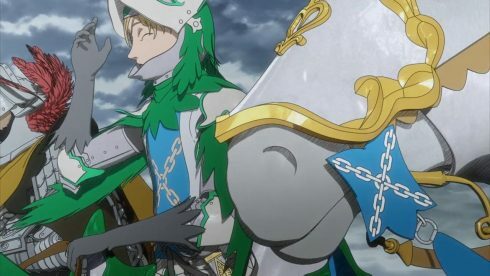 There’s a fair bit that these two do together, and kill together, before we get into the Holy Chain Knights situation. And as is always the case with adaptions that seem to be in a rush to get somewhere fast, I’m both worried and wondering why? 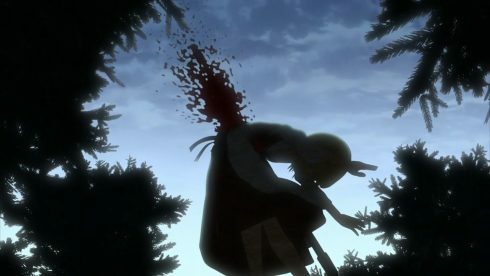 I’d rather just have a really good, slow paced show that takes the time to build up everything, and does the manga and the story justice, rather than just seeing whatever is designated as the “good parts”. Maybe the opening chapter is just not interesting enough for director Shin Itagaki to cover in this series. 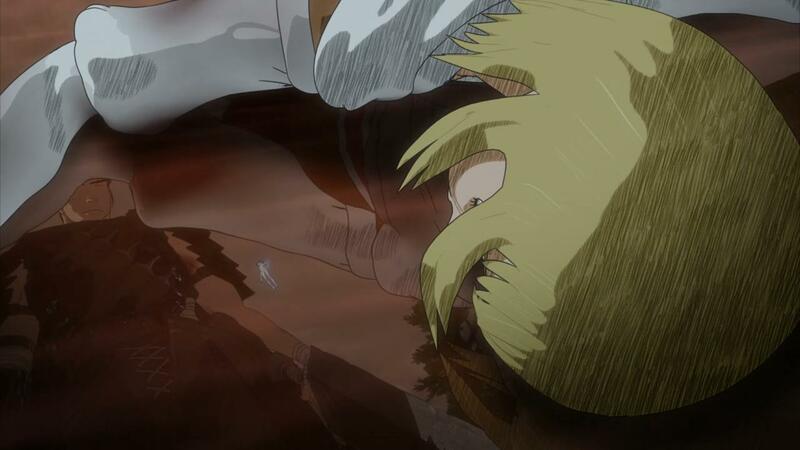 And I suppose, I can kind of understand the need to just get on with it, as even Full Metal Alchemist Brotherhood was guilty of rushing through its opening chapters, and wasn’t too excited to retread old ground. Having said all of that, right now, I wouldn’t say Berserk’s 2016 incarnation is bad, its actually decent, and there’s a lot of signs of a respect and interest in covering the source material properly. 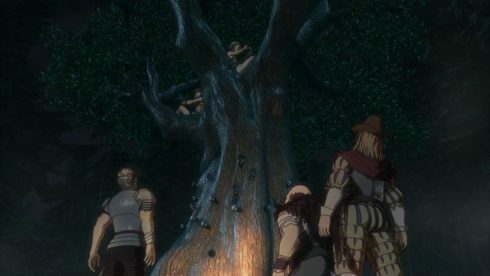 Maybe this first episode was just rushed through so that we could get the introduction over with, and jump into the story post the Golden Age era. 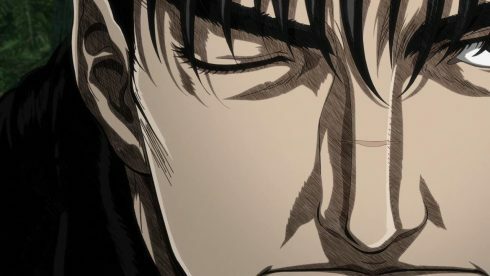 While that is a bit of a shame, I think it’ll be the next few episodes that really determine whether Itagaki’s Berserk is going to be the definitive adaption or not. I’m definitely feeling optimistic after what I saw this week, at the very least. 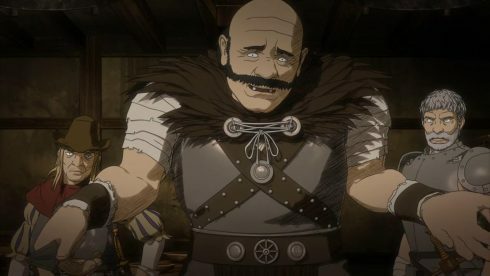 Its just nice to be back in this dark, grim and fairly unique fantasy world, after such a long break from it. 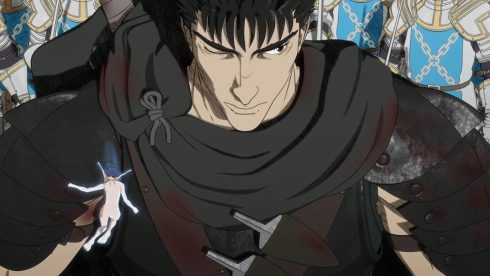 I’ll be covering Berserk on a weekly basis as one of the series I blog this season, so I guess we’ll find out how it goes in the coming weeks.